Intrepid seafarers seeking glory and gold need look no further than the vast and untamed island chain known as the Shackles. Throughout these isles, undead cyclops guard eons-old treasure vaults, lycanthropic pirates maraud the waterways, and cannibalistic natives sacrifice trespassers to their otherworldly god-queen. On the treacherous seas surrounding the Shackles, a bold sailor may even rise to become one of the realm's infamous Free Captains, second only to the bloodthirsty Hurricane King himself - though the rapacious pirates who raid the archipelago's ports ensure that only the cunning and swift survive for long. An expansive overview of the six civilized regions of the Shackles, from the mainland's sprawling seaside metropolis of Port Peril to the sahuagin-plagued shores of Shark Island, complete with details on histories, notable rulers and personalities, and gazetteers of each region's varied locales. Detailed entries on more than 20 of the Shackles' most dangerous and mysterious islands and islets, each with numerous plot hooks, helpful or treacherous NPCs, and unique locations for ave adventurers to discover and explore. Stat blocks for each island, detailing the region's notable settlements and denizens, as well as possible plunder and resources, such as hidden harbours and shipwrecks. 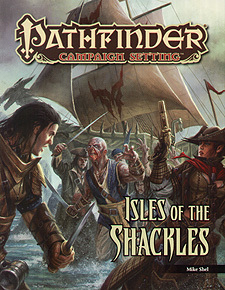 Isles of the Shackles is intended for use with the Pathfinder Roleplaying Game and the Pathfinder campaign setting, but can easily be used in any fantasy game setting.